Tosegu (東 照 宮) – Shinto shrine in Nikko and the burial place of the famous Tokugawa Ieyasu, the founder of the Tokugawa shogunate. Tokugawa Ieyasu was born December 26, 1542 in Okazaki Castle in Mikawa. Having founded the Tokugawa Shogunate, the governor managed to establish peace in the whole of Japan, and to create a unified, centralized state. Ieyasu brought in Japanese society organization and order, in addition, he is considered to be a famous patron of sciences. Ieyasu died at age 75 and was buried April 17, 1616 in Kunozan. According to the last will of the ruler, his remains were to be transferred in a year, and that was done in the temple tomb Tosegu. 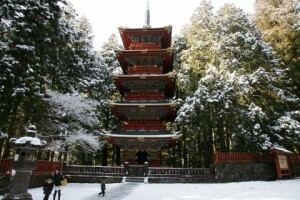 At that time, the temple was named “Tosё”. In 1637 the temple area was enhanced by Ieyasu’s grandson – Tokugawa Iemitsu. 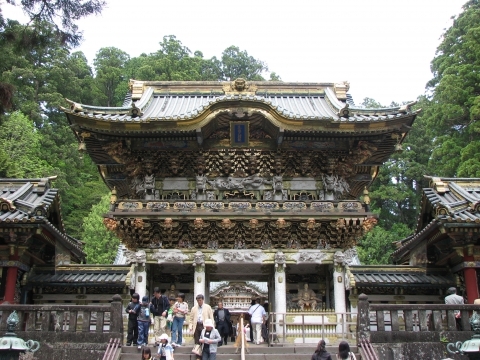 So initially modest burial place of the great shogun was beautiful Nikko temple complex, consisting of 12 beautiful buildings. 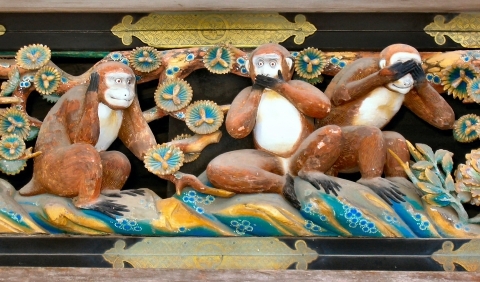 Wooden buildings are decorated with intricate carvings and gold leaf – this approach was not very typical of the 17th century, as the external and internal decoration of Shinto shrines, as a rule, been modest. Curiously, the Shinto shrine Tosegu combines architectural elements typical of both Shinto religion and Buddhism. It was common, when one or the other temple combined the traditions of two major Japanese religions. But in 1868 the government decided to divide the Shinto and Buddhist shrines, on the basis of political considerations. The elements of the Buddhist style of architecture eradicated in Shinto temples and vice versa. However Tosegu to a certain extent managed to avoid the sad fate. One of the main buildings of the complex – Hondzido room, where he lives, “crying dragon”. There is a view large image of dragon on the ceiling of the building. For visitors regularly arranged small presentation during which you may be lucky enough to hear the “cry of the dragon”: monk strikes a special wooden sticks against each other, resulting in the power of acoustic characteristics of the room down the hall resounds long ringing sound. It is believed that if you could hear the same “crying,” Your dearest wish will come true. The main building of the temple complex includes a prayer hall Hayden, from which visitors enter the main hall. Inside the building is very nice, however, remember that taking photos is strictly prohibited. To the right of the main building are Sakasitamon Gate, the famous carved image of a sleeping cat, or Nemurineko. From the gate begins Sakasitamon staircase leading to the very tomb of Tokugawa Ieyasu. Lifting takes about 5 minutes. The tomb, as you can see, is very simple, almost ascetic look, but at the same time not devoid of dignity.